In the lingo of government budgets, a "tax expenditure" is a provision of the tax code that looks like government spending: that is, it takes tax money that the government would otherwise have collected and directs it toward some social priority. Each year, the Analytical Perspectives volume that is published with the president's proposed budget has a chapter on tax expenditures. 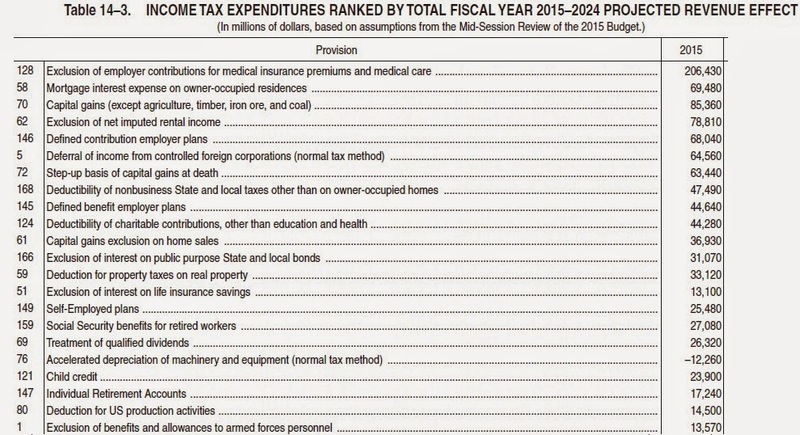 Here's a list of the most expensive tax expenditures, although you probably need to expand the picture to read it. The provisions are ranked by the amount that they will reduce government revenues over the next five years. It includes all provisions that are projected to reduce tax revenue by at least $10 billion in 2015. 1) The monetary amounts here are large. Any analysis of tax expenditures is always sprinkled with warnings that you can't just add up the revenue costs, because a number of these provisions interact with each other in different ways. With that warning duly noted, I'll just point out that the list of items here would add up to about $1 trillion in 2014. 2) It is not a coincidence that certain areas of the economy that get enormous tax expenditures have also been trouble spots. For example, surely one reason that health costs have risen so far, so fast, relates to the top item on this list, the fact that employer contributions to health insurance and medical care costs are not taxed as income. If they were taxed as income, and the government collected an additional $206 billion in revenue, my guess is that such plans would be less lucrative. Similarly, one of the reasons that Americans spend so much on housing is the second item on the list, that mortgage interest on owner-occupied housing is deductible from taxes. Without this deductibility, the housing price bubble of the mid-2000s would have been less likely to inflate. Just for the record, I have nothing personal against either health care or homeownership! Indeed, it's easy to come up with plausible justifications for many of the items on this list. But when activities get special tax treatment, there are consequences. 3) Most of these tax expenditure provisions have their greatest effect for those with higher levels of income. For example, those with lower income levels who don't itemize deductions on their taxes get no benefit from the deductibility of mortgage interest or charitable contributions or state and local taxes. Those who live in more expensive houses, and occupy higher income tax brackets, get more benefit from the deductibility of mortgage interest. Those in higher tax brackets also get more benefit when employer-paid health and pension benefits are not counted as income. 4) These tax expenditures offer one possible mechanism to ease America's budget and economic woes, as I have argued on this blog before (for example, here and here). Cut a deal to scale back on tax expenditures. Use the funds raised for some combination of lower marginal tax rates and deficit reduction. Such a deal could be beneficial for addressing the budget deficit, encouraging economic growth, raising tax revenues collected from those with high income levels, and reducing tax-induced distortions in the economy You may say I'm a dreamer, but I'm not the only one. After all, a bipartisan deal to broaden the tax base and cut marginal rates was passed in 1986, when the president and the Senate were led by one party while the House of Representatives was led by the other party.